Whatever the time of day, venue, or occasion, this page of vegetarian recipes and menus can help you plan the perfect meal. I know many people don’t like it, but I swear by eating a good breakfast – it gives me more energy throughout the day and keeps me from thinking about lunch from 10am on. 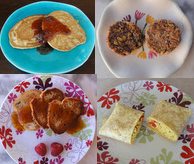 Here are some of my favorite breakfast recipes. Brunch can seem tricky to pull off, as it’s a combination of breakfast and lunch. In fact, it’s the easiest thing in the world – just be sure to combine a bit of both meals, with an emphasis on things that are easy to prepare and easy to serve. Recipes for vegetarian main courses, soups, salads, and side dishes organized by cuisine and occasion. You can mix and match to make a delicious vegetarian meal! Unlike dinner, which is usually a sit-down and chat with the family affair, lunch often has to be squeezed in between work or school commitments. Lunch also lends itself to combo meals: soup and salad, salad and sandwich, and sandwich and soup, so here are some suggested pairings that you can mix and match for a delicious, healthy vegetarian lunch. I don’t know about you, but I absolutely love picnics. There’s something about sitting outside when it’s nice and warm, sipping a cool drink, and nibbling away at simple but tasty food. Here are some recipes and ideas to help pack the perfect vegetarian picnics. This page includes recipes for vegetarian side dishes, snacks, and appetizers that aren’t salads or soups. Whether you love home baked bread or just need to know the basics of cooking quinoa and rice, these recipes will keep plenty of breads and grains on your table. Some meals just aren’t complete without a table full of condiments, dressings, and other garnishes, so try these on for size. Dips are so versatile. You can keep one in the fridge for an easy snack, offer a couple at a drinks party, or serve half a dozen different ones for an informal, interesting dinner. Why buy drinks when you can make your own? They’re always cheaper, usually healthier, and often even better-tasting than what you can buy in a café or at the store. Ah, salad. That’s all vegetarians eat, right? Of course not! But most of us do eat a fair amount of salad, and personally, I get tired of eating the same old lettuce every day. Here are recipes for some of my favorite salads. For quick, healthy, and tasty meals, nothing beats a vegetarian sandwich or veggie burger. Sauce can make or break a recipe. You want it to be flavorful without overpowering the rest, or delicate enough to make whatever it tops taste even better. Here are my recipes for the best vegetarian and vegan sauces, from basic to exotic to the ultimate in creamy comfort food. Whether hot or cold, a bowl of soup is chock-full of nutrition and flavor. From classic vegetable soup to split pea soup (with smoked tofu, for that traditional “hammy” flavor), you’ll find dozens of vegetarian and vegan soups in these pages, as well as tips on thickening soup. Meals with a mixed group of vegetarians and non-vegetarians can require a lot of extra effort from the cook. However, you can save a lot of work by making similar dishes for both groups – a vegetarian version and a meat version. Here are some adaptable vegetarian recipes that lend themselves easily to meat additions. If you’re having a dinner party or some other event where you’re hoping to impress people (especially if those people aren’t vegetarian), try these gourmet vegetarian recipes – guaranteed to look beautiful and taste delicious. Planning a French, Mexican, or Middle Eastern party? Find delicious vegetarian recipes from different corners of the earth right here. Deciding to give up certain foods and become a vegetarian yourself is one thing, but it can be difficult to convince your kids to do the same. How can you encourage kids to eat healthy, vegetarian meals? Try some of these tried and true recipes. In a hurry? Have unexpected company? Need to eat and run? Take a look at these quick vegetarian recipes – each one takes one hour or less from start to finish. Find recipes for Thanksgiving, Christmas, Hanukkah, Valentine’s Day, Kwanzaa, Easter, and New Year’s.